This Christmas tree fruit platter is one of those healthy Christmas snacks you can feel good about feeding to your kids. It’s a nice break from all of the sweets we tend to eat during the holiday season. I made this healthy Christmas tree fruit platter for my kids and their cousins to snack on while decorating gingerbread houses (thanks to our Kindness Elves). Because candy. My kids ate So Much Candy! I knew they would, so I tried to be prepared with these healthy Christmas snacks in the form of a tree. Plus, it was fun to make and got my creative juices flowing. 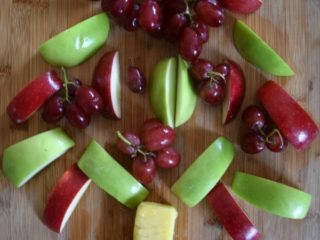 To make a healthy Christmas tree fruit platter, you will need: 1 gala apple, 1 granny smith apple, 2 pineapple spears, 1 bunch red grapes, and either Fruit Fresh or lemon juice. 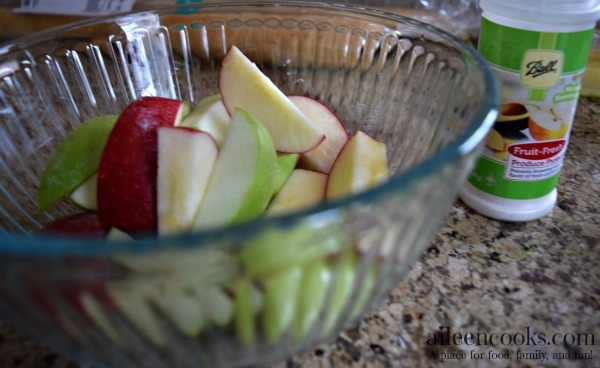 To start, slice up your apples and toss them in the Fruit Fresh or lemon juice. This will keep them from browning. Next arrange your apples into tree branches and use the pineapple spears to make the stem and star. If you have a small star cookie cutter, you could cut a star out of the pineapple and it would look even cuter! Lastly, fill in the gaps with grapes to create ornaments. 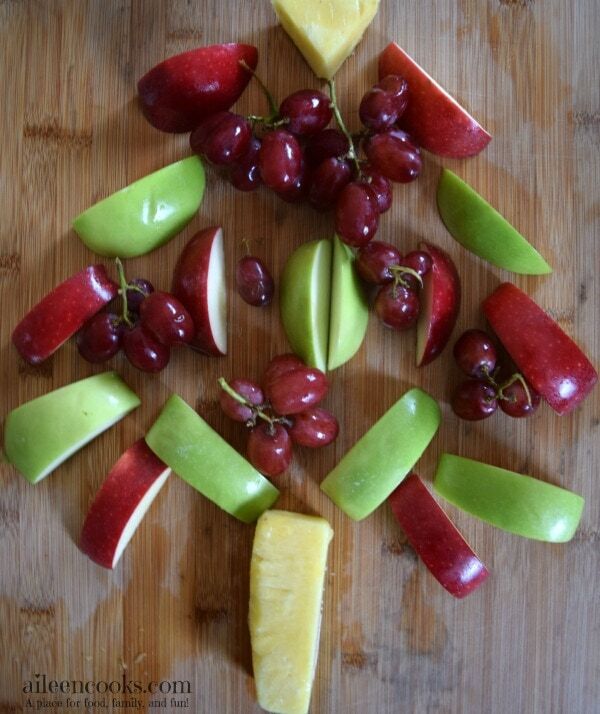 Create a fun and healthy holiday spread with this Christmas Tree shaped fruit platter. Slice apples and toss in Fruit Fresh (or lemon juice). 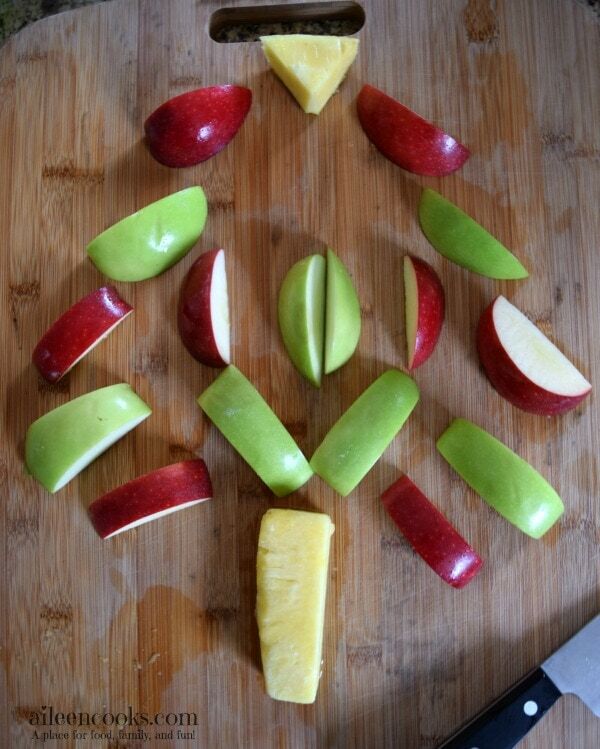 Arrange apples on a platter in the form of a tree and use the pineapple spears for the stem and star. Break the bunch of grapes into small bunches and place throughout the tree as ornaments.